The next two fields (Oldest article and Max. number of articles) allow you some control over how many articles should be downloaded from each feed, and they are pretty self explanatory. To add the feeds to the recipe, enter the feed title and the feed URL and click the Add feed button. Once you have added the feed, simply click the Save button and you’re done! Close the dialog. Follow the procedure outlined in The calibre blog above to create a recipe for The BBC (using the feeds above). Looking at the downloaded e-book, we see that calibre has done a creditable job of extracting only the content you care about from each article’s webpage. However, the extraction process is not perfect. Sometimes it leaves in undesirable content like menus and navigation aids or it removes content that should have been left alone, like article headings. In order, to have perfect content extraction, we will need to customize the fetch process, as described in the next section. When you want to perfect the download process, or download content from a particularly complex website, you can avail yourself of all the power and flexibility of the recipe framework. 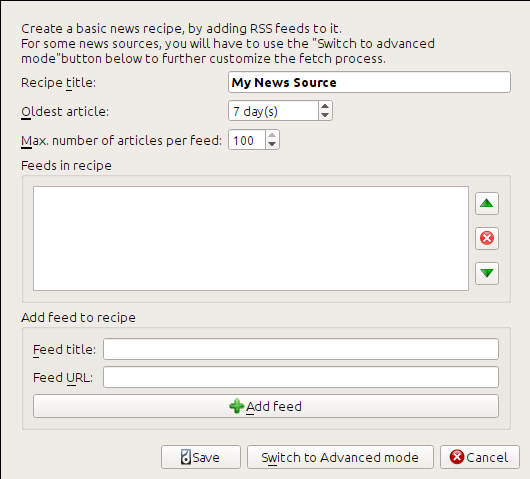 In order to do that, in the Add custom news sources dialog, simply click the Switch to Advanced mode button. The new version looks pretty good. If you’re a perfectionist, you’ll want to read the next section, which deals with actually modifying the downloaded content. This recipe explores only the tip of the iceberg when it comes to the power of calibre. To explore more of the abilities of calibre we’ll examine a more complex real life example in the next section. These remove everything before the first <h1> tag and everything after the first tag whose id is footer. See remove_tags, remove_tags_before, remove_tags_after. The final new feature is the calibre.web.feeds.news.BasicNewsRecipe.preprocess_html() method. It can be used to perform arbitrary transformations on every downloaded HTML page. Here it is used to bypass the ads that the nytimes shows you before each article. The command ebook-convert will download all the webpages and save them to the EPUB file myrecipe.epub. The -vv option makes ebook-convert spit out a lot of information about what it is doing. The ebook-convert-recipe-input --test option makes it download only a couple of articles from at most two feeds. In addition, ebook-convert will put the downloaded HTML into the debug/input directory, where debug is the directory you specified in the ebook-convert --debug-pipeline option. Documentation of the BasicNewsRecipe class and all its important methods and fields. Lots of knowledgeable calibre recipe writers hang out here.